Cumbria LDWA and friends enjoyed a week in the Mourne Mountains in Northern Ireland, staying in Newcastle, Co Down. Sunday started in typical Irish style (rain and mist) and was spent exploring Newcastle, the coastline past the Royal County Down Golf Club and beyond to the village of Dundrum, or walking in the splendid Tollymore Forest Park. Slieve Donard was the objective of Day two and on Tuesday, Slieve Loughshannagh, Slieve Meelbeg and Slieve Meelmore. Also included through the week was a range of sightseeing opportunities, namely Giant’s Causeway, Antrim Coast Road, Glens of Antrim, Carrickfergus, Mount Stewart (NT), the Ards Peninsula, Hillsborough and Belfast, a fine sample of what the tourist can visit in a short space of time. 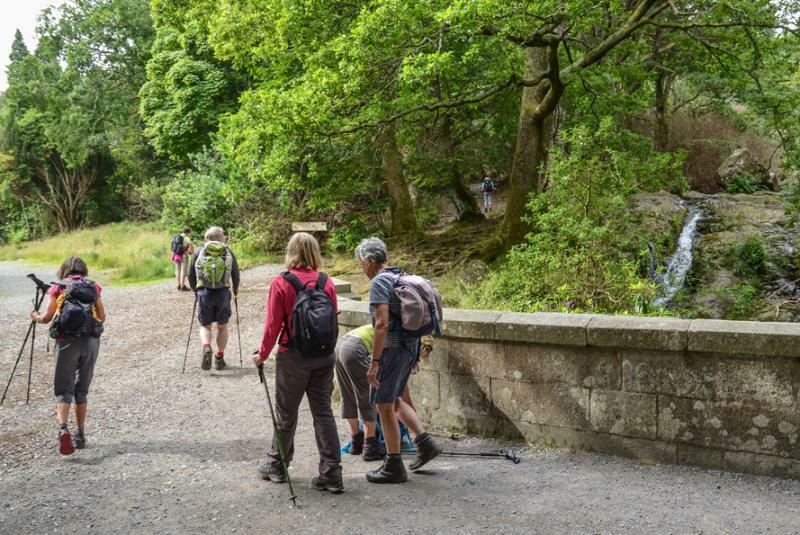 In terms of walking, the best was saved to last – a walk on Friday taking in Slievenaglogh, Slieve Corragh, Slieve Comedagh, the Brandy Pad to Hare’s Gap, the Diamond Rocks and the Mourne Wall, altogether twelve miles with 4,700 feet of ascent. This was a truly spectacular hike with weather to match, prompting one seasoned walker to comment that these views were amongst the best she’d ever seen in the mountains and another (NI born and bred) to point out that it was a rare privilege to be in the Mournes in such superb conditions. All enjoyed the hills, the weather and the craic, including the gastronomic experience of champ, complete with bacon and cabbage, unfamiliar pronunciations (Slievenaglogh?) and the delights of Morelli’s ice cream. 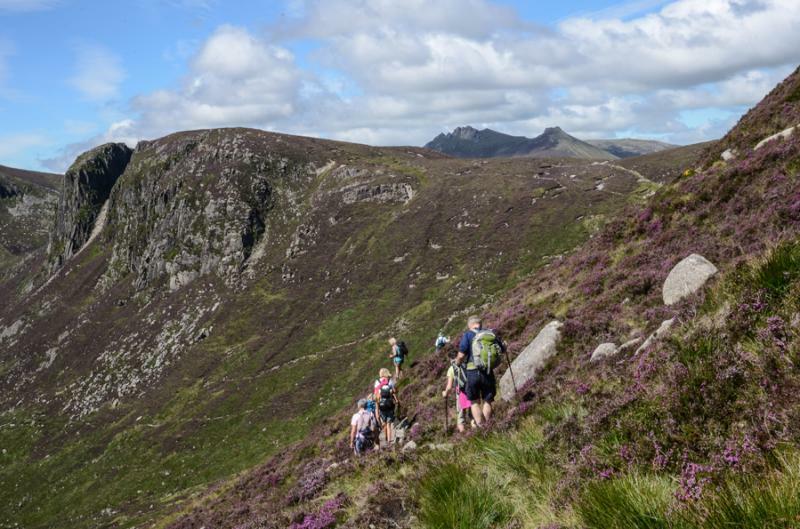 The Mournes are an accessible range of mountains, though challenging enough in poor weather. They comprise the Ring of Mourne with table-top Slieve Gullion beyond. 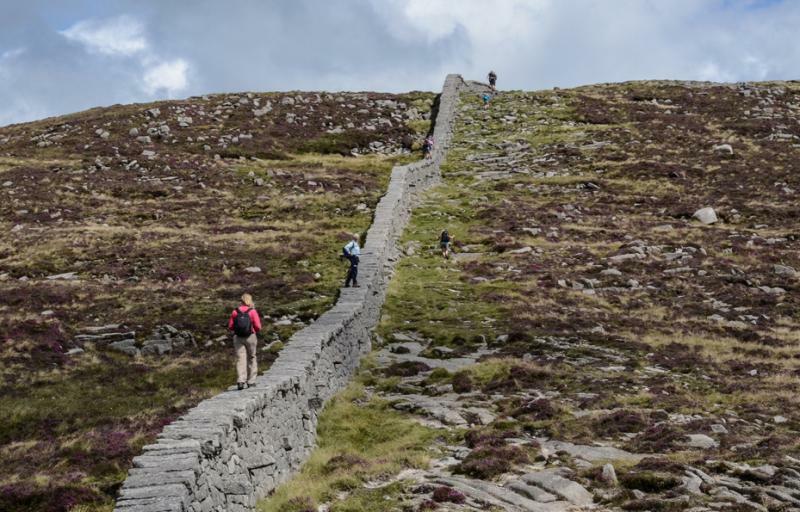 A feature of the central Mournes is the Mourne Wall built to mark out the area round the Silent Valley reservoir supplying water to Belfast. 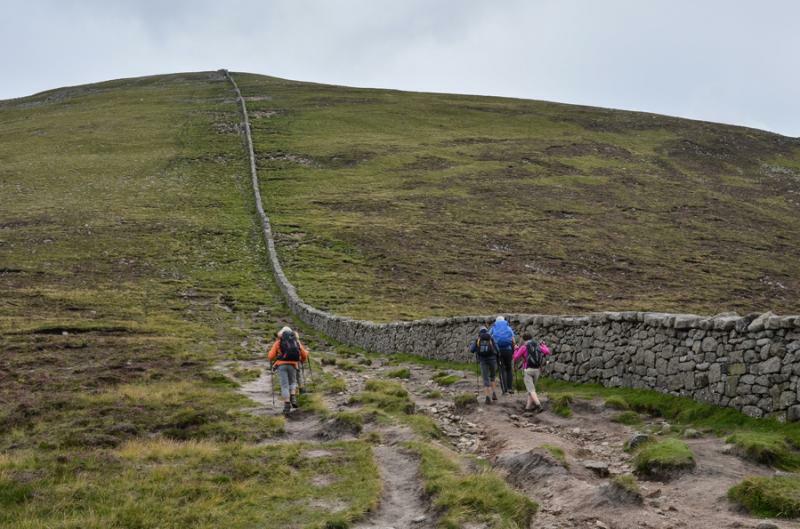 It is possible to walk the wall with 22 miles ascent and descent of fifteen mountains of Mourne, in some places actually on top of the wall, which was attempted by some! Travel was by car and ferry, accommodation self-catering (the excellent Armitage House, on South Promenade, Newcastle. Thanks are due to James for organising and to everyone for their company and contributions to the success of the week.